• 3.7oz, 100% Preshrunk Combed Cotton Lightweight Jersey. • Set in front cover stitch 1×1 Baby Rib collar. This T-shirt is unique as the graphic design changes color. For this shirt, the dark blue design changes to a light blue when you go out in the sun. My daughter wore it to school and got lots of attention. The shirt is lightweight, soft and comfortable. She liked the way it fit and likes that you can see her necklaces with the scoop tee. She also liked how the shirt was breathable and stretchy. This is a great summertime shirt. This tee comes in sizes small, medium, large, XL and 2XL. The size is right on; it doesn’t run small. The shirt is pre-shrunk, so you don’t have to order a size up fearing it will shrink once you wash it. No matter how many times you wash this shirt, it will still change colors. • Many different color combinations to choose from plus seasonal colors throughout the year, all toluene-free. • Large 0.5-ounce Italian glass bottles with stainless steel mixing balls. We received the colors shown above, Metal Mania and On Fire. My daughter tried this out right away with her color-changing shirt. The polish has a nice brush that applies the polish evenly. The Metal Mania polish has a smooth surface once applied to your nails. The On Fire polish has a rough texture once applied. The bottles are made of heavy-duty, thick Italian glass. The polish doesn’t chip off easily. It dries really fast. My favorite of the two is the On Fire nail polish. I love the multi-colored glitter, and it makes my nails sparkle. I was able to wear this polish out in the sun once since I’ve received them. The color changed instantly! I plan on taking some pictures of my nails and posting them once we have a nice day. • Same great cut and contouring as the short sleeve women’s crew tee; now in a long-sleeve option. • 9.0-ounce fabric, which allows it to remain ultra soft and still hold its shape and form. • Custom collar with proprietary fabric weave and blend, giving it premium thickness, softness, elasticity, durability, and comfort. • Additional branding detail on the bottom of shirt hem. • Tagless logo labels on the neck, keeping your shirts ultra soft all over. • 70% viscose from bamboo / 30% organic cotton. This is my very first piece of clothing made from bamboo. I had to try it on as soon as it arrived. I fell in love with the shirt right away. It was super soft and lightweight. I loved how it felt on my skin. It was very cooling. It actually made my skin tingle. I had to look up the benefits of bamboo and found out that it has a cooling effect in summer and a warming effect in winter – how cool is that? Finding that out made me fall in love with this shirt even more. I have what is known as polymorphous light eruption, sensitivity to sunlight. When I go out in the sun, I have to keep my skin covered. I have some scars on my hands and arms from the hives caused by the sun, so I wear long sleeve shirts as much as possible. This shirt is perfect for me to wear all year long. The shirt soaks up your sweat instantly and keeps you dry. The shirt stays in place and doesn’t ride up. You can get this shirt in black or white, and it comes in sizes XS – 2XL. The shirt doesn’t shrink once washed. I Love, Love, Love this shirt!!! If you haven’t tried bamboo, you should. You’ll love it, too! I found all the items I reviewed to be unique and fun. 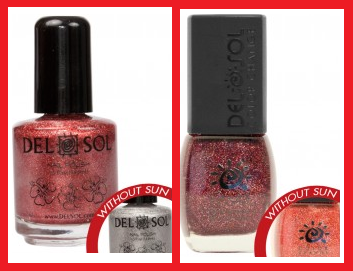 The Del Sol color-changing products were fun, and the nail polish was a huge hit at school recess. All the other children wanted some. I was told even a couple teachers asked her about it. The Cariloha shirt is amazing and functional. I have put this shirt on my Christmas List. The quality is outstanding on all products reviewed. I will be recommending PW Companies to friends and family. You can find Del Sol on Facebook and Twitter. Disclosure: I received the product above for free in exchange for an honest product review. I was not compensated and all opinions are my own. This post is not sponsored nor endorsed by Facebook or Twitter or any other social networking site. I am disclosing this in accordance with the Federal Trade Commissions 16 CFR, Part 255 Guides Concerning the Use of Endorsements and Testimonials In Advertising.